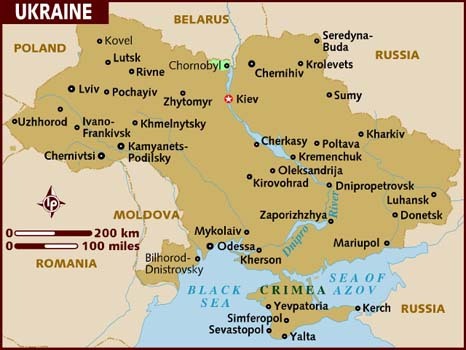 Ukraine is a country in Eastern Europe bordered in the East and Northeast by Russia, in the Northwest by Belarus, in the West by Poland, Slovakia and Hungary, in the Southwest by Romania and Moldova and in the South and Southeast by the Black Sea and Sea of Azov. Bordering with Russia in two separate areas, it is not difficult to understand Russia’s interest in Ukraine. US interest is however more complex. Despite much improvement in the US-Russia relations in the past decade, mutual mistrust and distrust have always been factored in any conversation, transaction or exchange. One does not need a doctorate degree to understand the eagerness of the US government to meddle in Ukraine’s affairs but one must ponder the benefits for the American people. The US government has already added one billion dollar ($1,000,000,000) to the taxpayers’ tab – against future earnings. Here in the United States, a 2006 census estimates puts the number of Ukrainian Americans at well over 960,000, a large majority of which live in the following cities: New York City, 160,000; Philadelphia, 60,000; Chicago, 46,000; Los Angeles, 34,000; Detroit, 33,000; Cleveland, 26,000 and Indianapolis,19,000. What do they want? They want what everybody else in the world wants, for the US government to continue to burden the taxpayers with debt and expense the soldiers’ lives. The president and Congress can’t wait to do just that. Is there anybody in Washington who represents the People of the United States?